Schumy working on World Championship form? 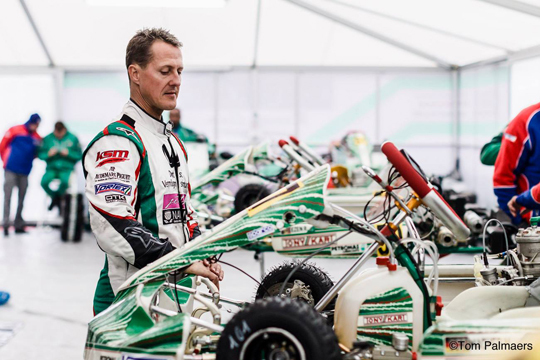 If any of you were still wondering whether Michael Schumacher still has what it takes to race with the best KZ1 drivers in the world, the free practice session held at Genk during the final round of the WSK Euro Series – the only one he actually took part in – can reveal Schumy’s true state of form. Schumy – referred to as n.47 / TEST – had a run on Friday afternoon on dry track, though the weather was anything but Spring-like (air temperature measuring 8° C). He had a total of 18 laps (3 of which slow-down laps), five in the 52” and five in the 51”, and his best lap (51”587) was realized on lap 15 (below you can download the whole free practice document). Schumy stopped the 5th fastest lap of the session at a little over than 1 tenth from Lennox-Lamb’s fastest. Just to reference the 7-time F1 World Champion’s effort, Marco Ardigò - running on same equipment - stopped five laps in the 52” and seven in the 51” with 51”487 as his fastest lap of the session. Obviously, Ardigò’s better condition (he races at the top every other weekend), younger age, and knowledge of the equipment are quite an advantage.